I got this recipe from my Taste of Home magazine. It was submitted by a woman in Springville. 1. Combine first 11 ingredients. 2. Before serving, stir in avocado. 3. 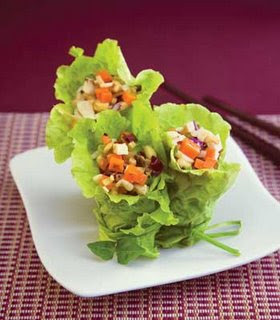 Scoop 1/2 cup of chicken mixture into each lettuce leaf & top with 2 t. sour cream. looks delicious--we had enchiladas last night with corn, but I forgot the sour cream. They turned out good. The best part is lettuce from our garden!